The perfect sunscreen for me is one that is lightweight and blends super well so that it leaves no white overcast and still offers me the protection I need. It’s been blistering hot in Singapore these days and a sunscreen is of utmost importance for everyone to be integrating in their skincare routine. A great sunscreen prevents an array of skin issues like pigmentation and even wrinkles further on in life. The main issue is that most sunscreens look super white on the skin and are too oily which makes make-up junkies like me super sad because how am I supposed to put make-up on something like that? 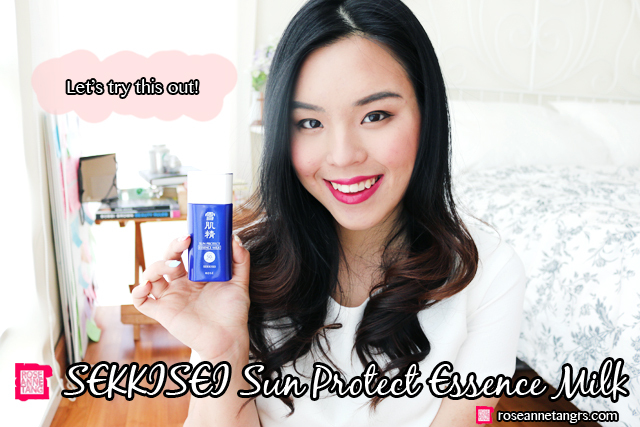 Thankfully, I’ve found two sunscreens both from KOSÉ that are super lightweight and leave no overcast at all. 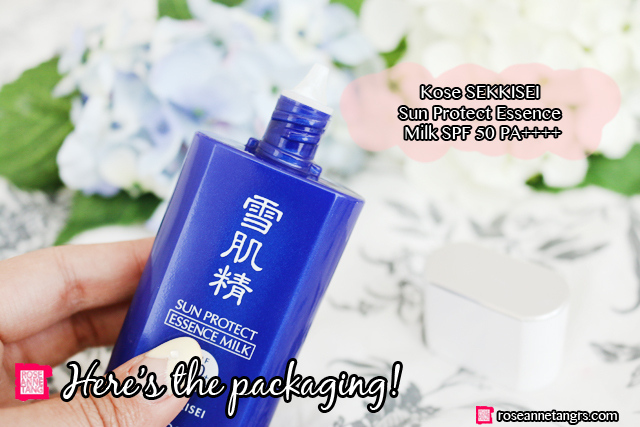 They’re the KOSÉ SEKKISEI Sun Protect Essence Milk SPF 50 PA++++ and KOSÉ SEKKISEI Sun Protect Essence Gel SPF 50 PA++++ that I’ll be reviewing today. KOSÉ is a very popular beauty brand here in Asia that was founded in 1946 by Kozaburo Kobayashi and they pride themselves in being at the forefront of dermatological and cosmetic research, producing many innovations in the beauty industry – including the world’s first two-way cake, beauty serum and even liquid foundation. The range that we’re talking about today is the SEKKISEI range, a brightening range that uses Oriental herbal extracts for the skin so that it can become as bright and radiant as fresh snow. 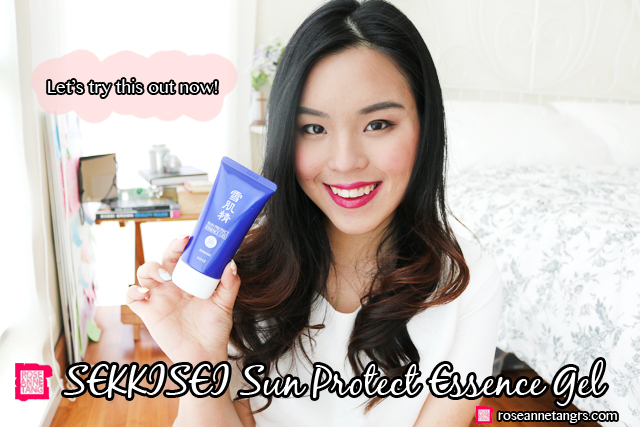 Let’s start with the KOSÉ SEKKISEI Sun Protect Essence Milk with SPF 50PA++++. This sunscreen is very lightweight and extremely thin in texture. It happens to be waterproof and when blended has a powder soft finish. Keeping with the SEKKISEI range, the sunscreen contains oriental herbal ingredients including Coix seed extract, Angelica extract, Melothria extract, Peach leaf extract and Jojoba seed oil which helps in hydration. Give the tube a good shake before use! When you pour it out, you immediately notice its very light and watery texture. 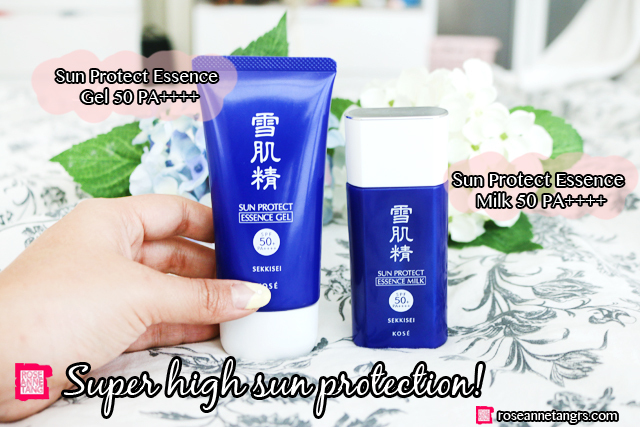 You can use this sunscreen for face and body and its also cool that its waterproof so that it can protect you even when you are doing outdoor activities. On the skin, it really feels like you’re putting on well – nothing. 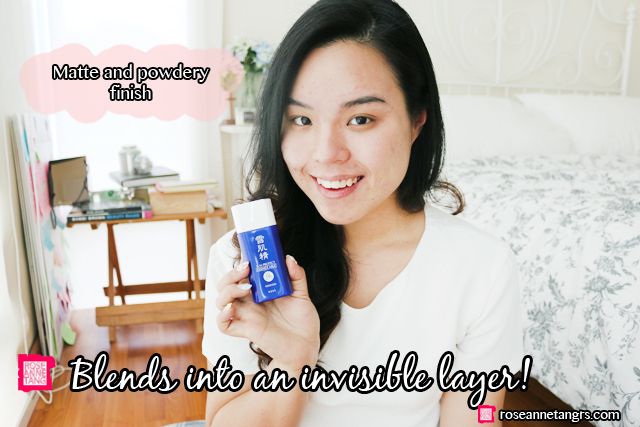 It’s so incredibly light and turns invisible when you apply it. It only leaves as it says a powder soft finish that is great for people with oily skin. Although the sunscreens are for all skin types, I would recommend this for people with oily skin very much because it is mattifying and will help keep the oilies at bay. 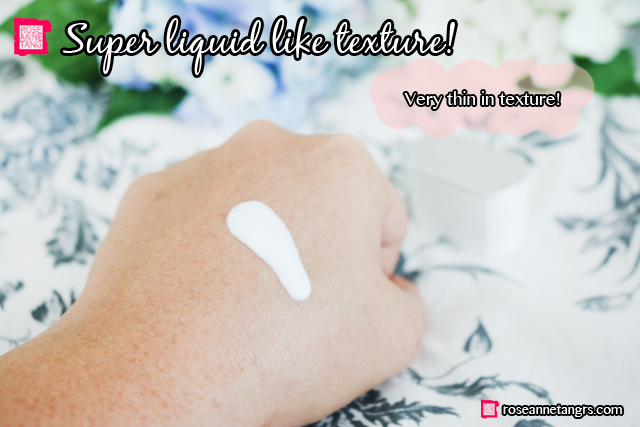 This I think would be best under make-up as well because the texture is so invisible that it will offer you the protection without getting in the way of an amazing make-up look and mixing with your foundation. 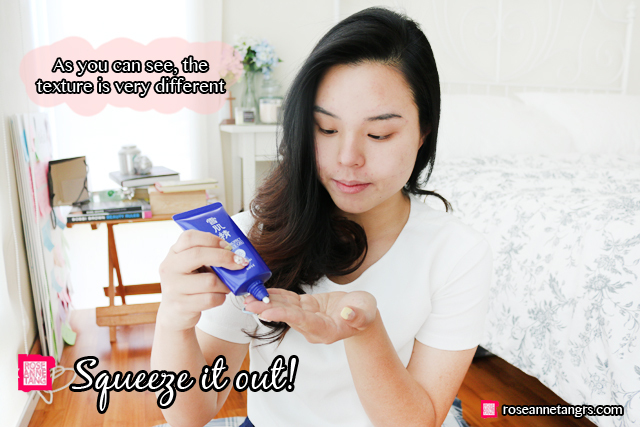 I love how it is so different from other sunscreens that I have tried! No white overcast and literally the opposite of a greasy finish. 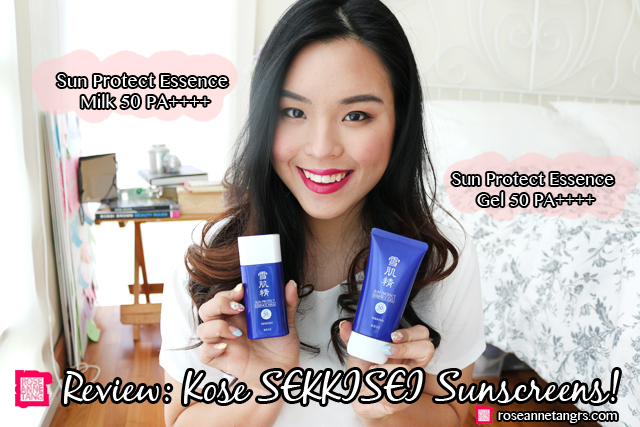 So how does the KOSÉ SEKKISEI Sun Protect Essence Gel compare to the KOSÉ SEKKISEI Sun Protect Essence Milk? They’re honestly two very different sunscreens as the textures are incredibly different. I hope I can help find the perfect one for you! 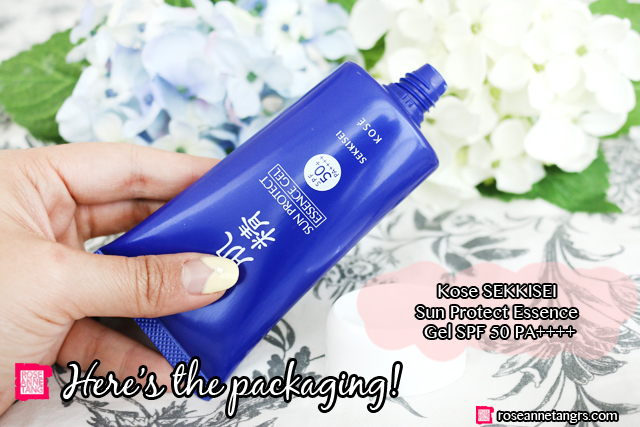 The KOSÉ SEKKISEI Sun Protect Essence Gel SPF50+PA++++ is a lightweight water-based sunscreen, also perfect for daily use. The gel-based sunscreen provides a moisturising and comfortable finish, gliding over the skin smoothly. Oriental plant extracts and minerals are used as in the milk, but the gel has added glycerin that provides an extra touch of hydration. 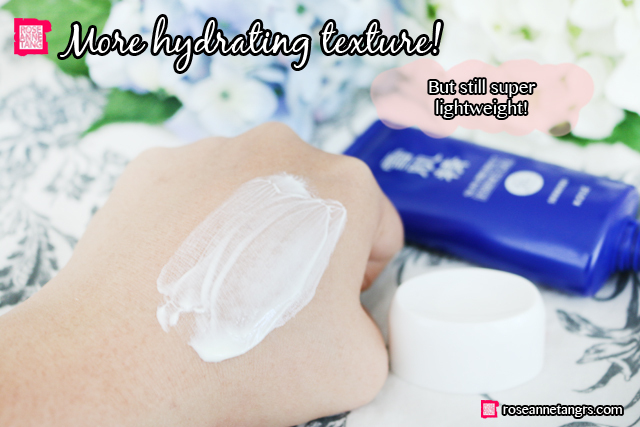 Unlike the milk, the gel is squeezed out from the tube and you can immediately feel the water gel texture that is cooling, refreshing and lightweight. This sunscreen for sure provides much more moisture than the milk and I like it because it wears comfortably on the skin. As you can see, this is a completely different texture! Unlike other sunscreens that squeeze out just like this, this sunscreen will not leave a thick white overcast nor feel heavy or greasy. When applied, it feels airy light and refreshing, blending into a watery gel texture that almost melts on your skin. It then disappears into your skin just like the milk. Your skin will feel moisturised, refreshed and much more hydrated. If you have dry skin, this one is a better pick for you I feel. It is not heavy at all and feels great actually! It also won’t interfere with your make-up application as it really does blend into your skin without any sticky feel or greasy feel. Overall, both are winners in my mind. Both are very lightweight, leave no white overcast and blend in flawlessly. 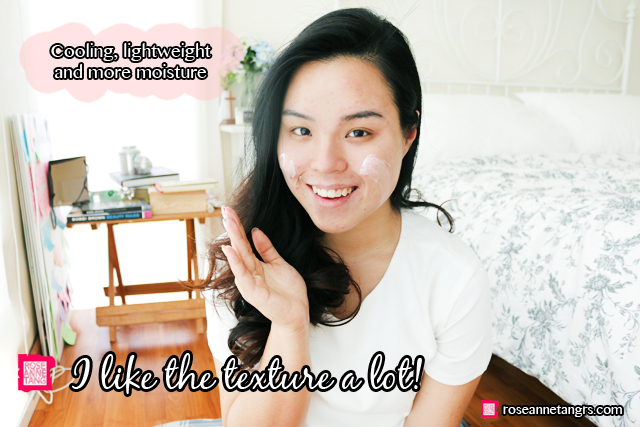 However, the Milk is waterproof and is perfect for oily skin days because it leaves a powder soft finish. The Gel is hydrating, jelly-like and leaves you skin with a touch of moisture and refreshed finish. It’s hard to say which one you’ll prefer, but you can always pop by any KOSÉ counter to try out the two different textures and decide for yourself! If I really had to choose one though…well you’ll have to stay tuned to my instagram (@roseannetangrs) for that! Also another reason to stay tuned to my instagram is that I’ll be having a contest and giveaway for some amazing KOSÉ SEKKISEI goodies so make sure you look out for it! Follow me on instagram @roseannetangrs. 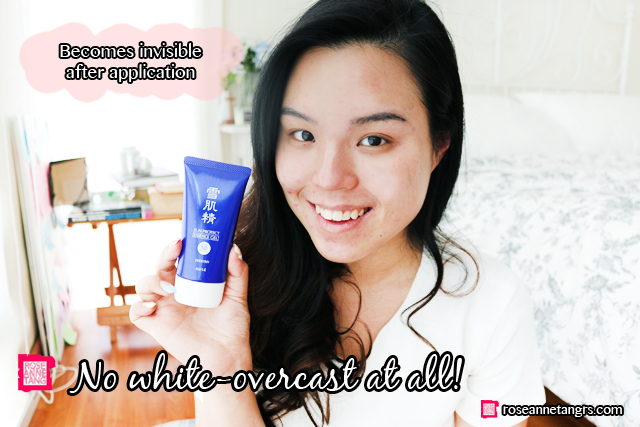 Disclaimer: This is an advertorial brought to you by KOSÉ Singapore. Light retouching was done in the photos but none to affect the integrity of this review nor product effectiveness. Benefit Agent Zero Shine Review – An "on the go" Shine Vanishing Pro Powder! I really like you blog. You reviews on skin products are really detailed and informative. A lot of people would find them very useful, especially in Singapore where looking after our skin is not an easy task.